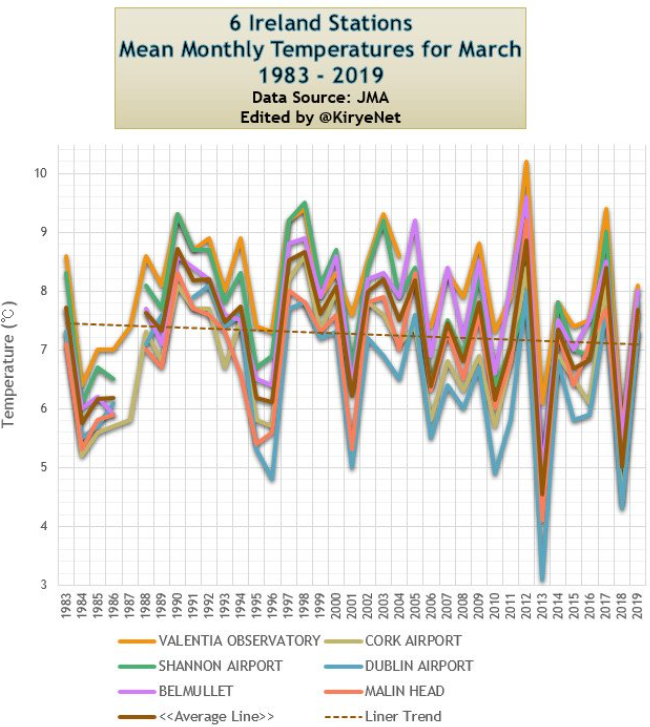 Today we’ll take a look at March mean temperatures and their trend for some locations for which almost complete data are available from the Japan meteorology Agency. 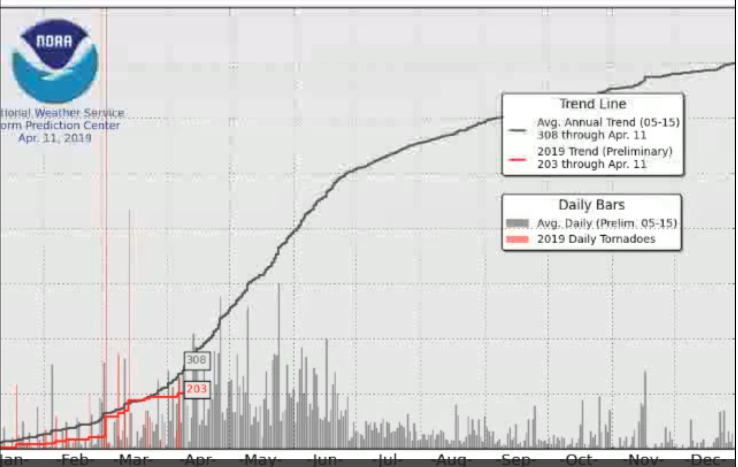 Though March is only a single month, it is important because we often hear how spring is supposedly arriving earlier due to global warming, and as a result winters will get shorter before disappearing altogether, according to some alarmists “experts”. The arrival of spring is also important because the length of the growing season depends on it. What follows first is the chart for March mean temperature for 9 stations scattered over Canada. These stations were selected because they are the very few that have almost complete data sets going back 3 decades. 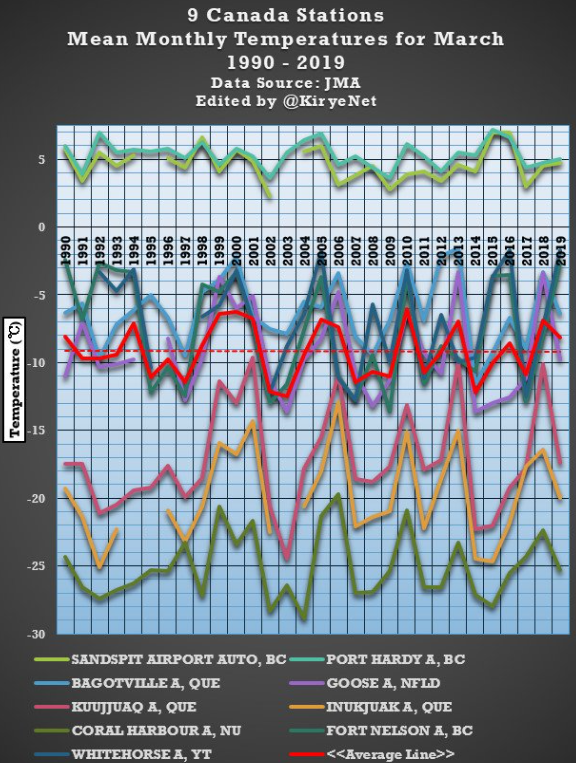 As the chart for Canada shows, spring in reality is not arriving earlier and the country’s already short growing season has remained short for 30 years. In Ireland the Northeast Atlantic island has seen its spring cooling since 1983, a total of 37 years. Moreover, the downward trend has even accelerated since the late 1990s. Here we see the spring month of March has not see any warming in over 30 years. 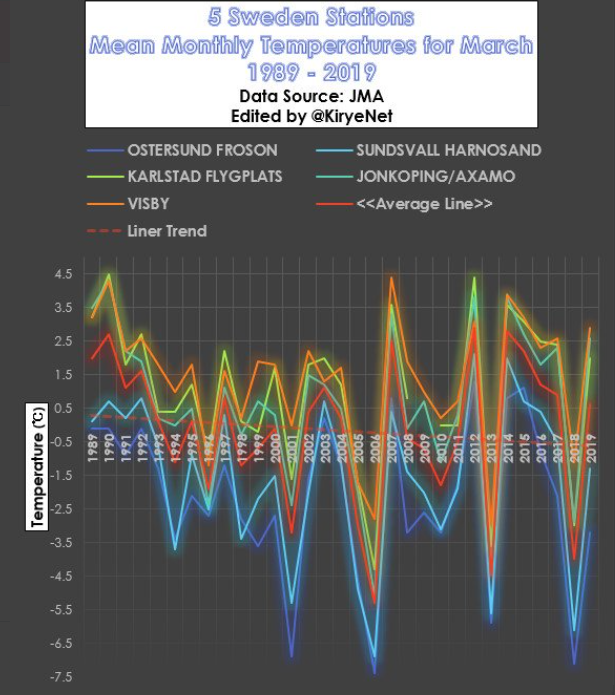 In Sweden we see that March has cooled off over the past 30 years, which points to the potentially bad news of shortening growing seasons there. 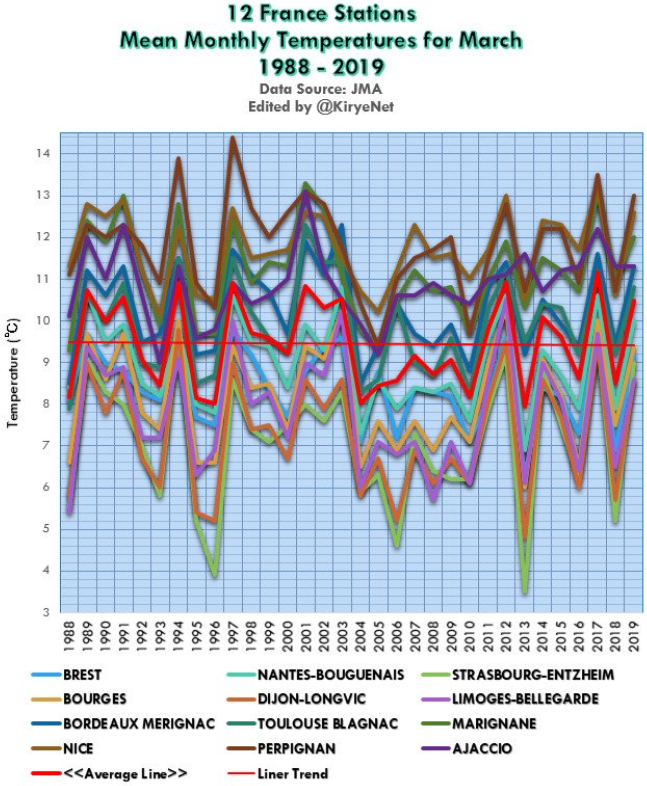 Although this is only a random sampling of data from the northern hemisphere, they show that the alarmist claims made by global warmists are more hype than they are reality. A few days ago here we wrote about how a team of German scientists at the Munich-based ifo Institute released the results of a study that showed that Electric cars end up producing more CO2 than comparable diesel cars. Electric vehicles will barely help cut CO2 emissions in Germany over the coming years, as the introduction of electric vehicles does not necessarily lead to a reduction in CO2 emissions from road traffic. Natural gas combustion engines are the ideal technology for transitioning to vehicles powered by hydrogen or “green” methane in the long term. Considering Germany’s current energy mix and the amount of energy used in battery production, the CO2 emissions of battery-electric vehicles are, in the best case, slightly higher than those of a diesel engine, and are otherwise much higher. 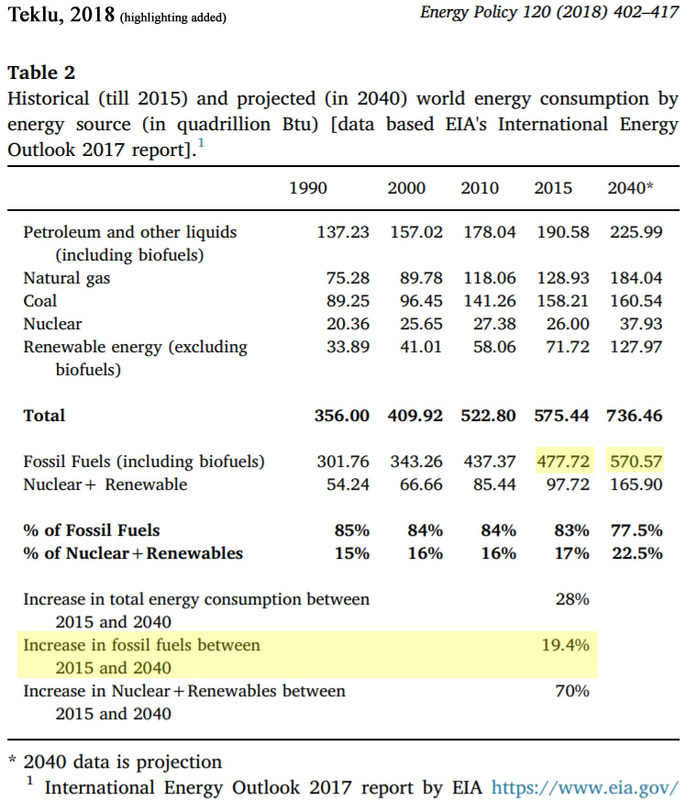 This has been confirmed by a new study by Christoph Buchal, professor of physics at the University of Cologne; Hans-Dieter Karl, long-standing ifo energy expert; and Hans-Werner Sinn, former ifo president and professor emeritus at Ludwig-Maximilians-Universität München. The researchers carried out their detailed calculations using the concrete examples of a modern electric car and a modern diesel vehicle. In addition to CO2 emissions from battery production, they looked at alternative energy sources for electricity in order to calculate the impact electric vehicles have on CO2 emissions. They show that even with today’s technology, total emissions from a combustion engine powered by natural gas are already almost one-third lower than those of a diesel engine. “Over the long term, hydrogen-methane technology offers a further advantage: it allows surplus wind and solar power generated during peaks to be stored, and these surpluses will see a sharp increase as the share of this renewable energy grows,” Professor Buchal explains. 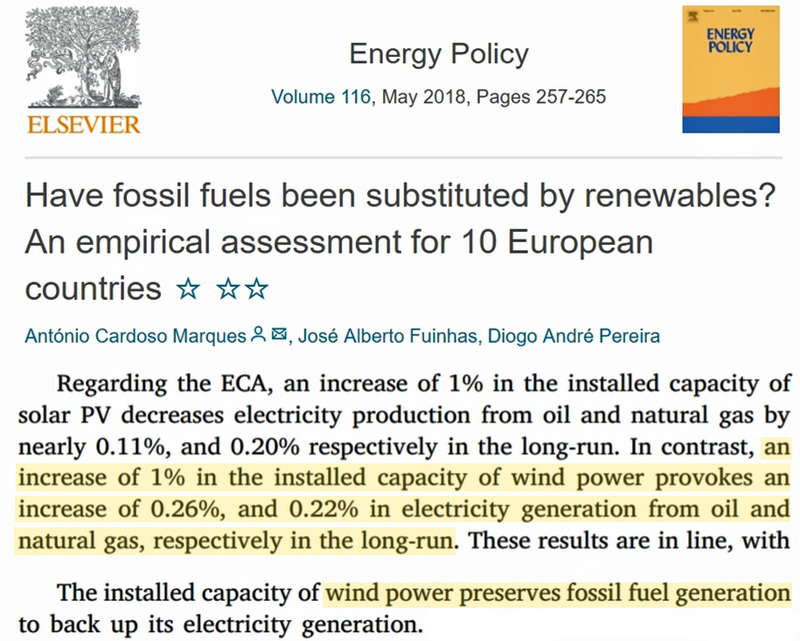 In their study, the authors criticize the fact that EU legislation allows electric vehicles to be included in calculations for fleet emissions with a value of “zero” CO2 emissions, as this suggests that electric vehicles do not generate any such emissions. The reality is that, in addition to the CO2 emissions generated in the production of electric vehicles, almost all EU countries generate significant CO2 emissions from charging the vehicles’ batteries using their national energy production mixes. The authors also take a critical view of the discussion about electric cars in Germany, which centers around battery-operated vehicles when other technologies also offer great potential: hydrogen-powered electric vehicles or vehicles with combustion engines powered by green methane, for instance. “Methane technology is ideal for the transition from natural gas vehicles with conventional engines to engines that will one day run on methane from CO2-free energy sources. This being the case, the German federal government should treat all technologies equally and promote hydrogen and methane solutions as well,” emphasizes Professor Sinn. The Earth has been rapidly greening in recent decades, and CO2 fertilization may explain 70% of the trend (Zhu et al., 2016). 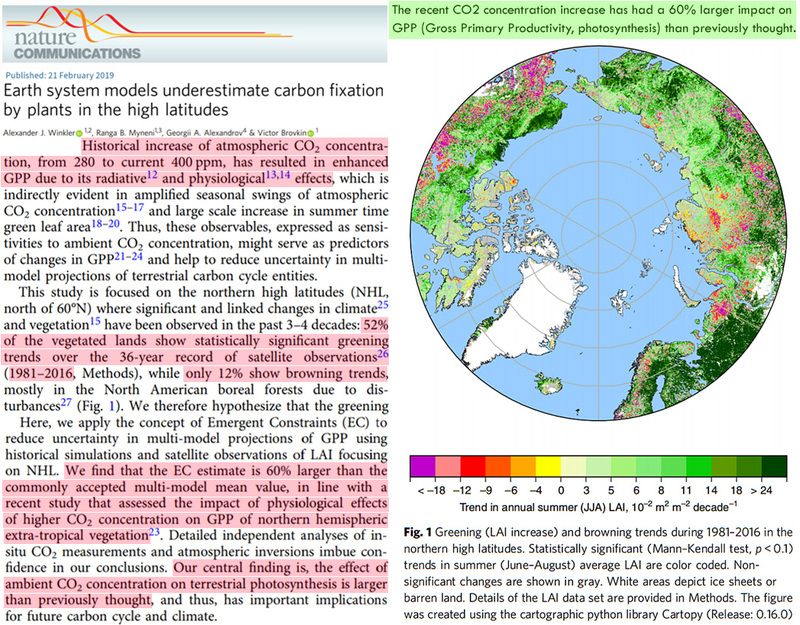 A new study finds models have significantly underestimated the greening effect of rising CO2. In recent years, carbon dioxide (CO2), an essential ingredient in plants’ food-making processes (photosynthesis), has been unscientifically cast as a villainous pollutant. 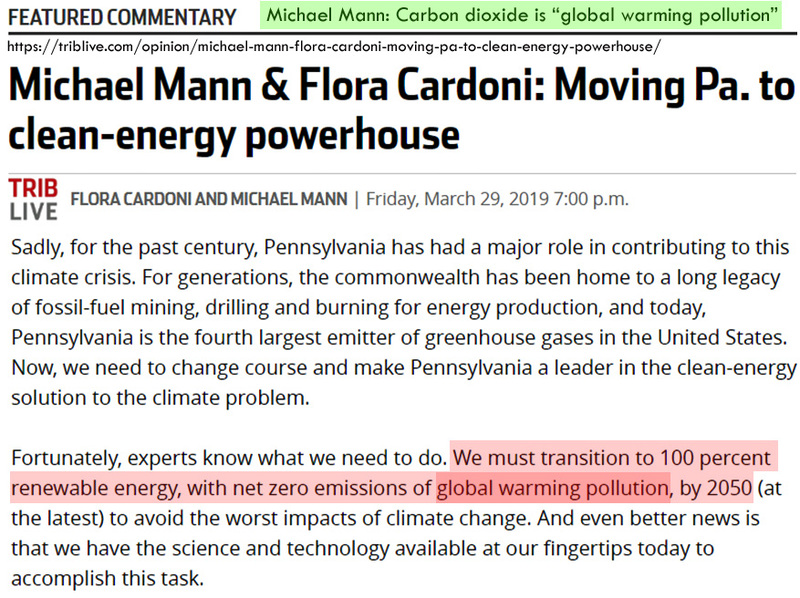 Scientists who apparently lack the political agenda of activists like Mann write glowingly about the biosphere-enriching effects of rising CO2 concentrations. Elevated CO2 is considered to be the primary driver of the observed global-scale greening in recent decades, especially in arid regions where soil water is in limited supply (Lu et al., 2016). Satellite observations indicate that between 25 to 50% of the globe’s vegetated regions are greener today than in the 1980s, whereas less than 5% have sustained a browning trend (Zhu et al., 2016). 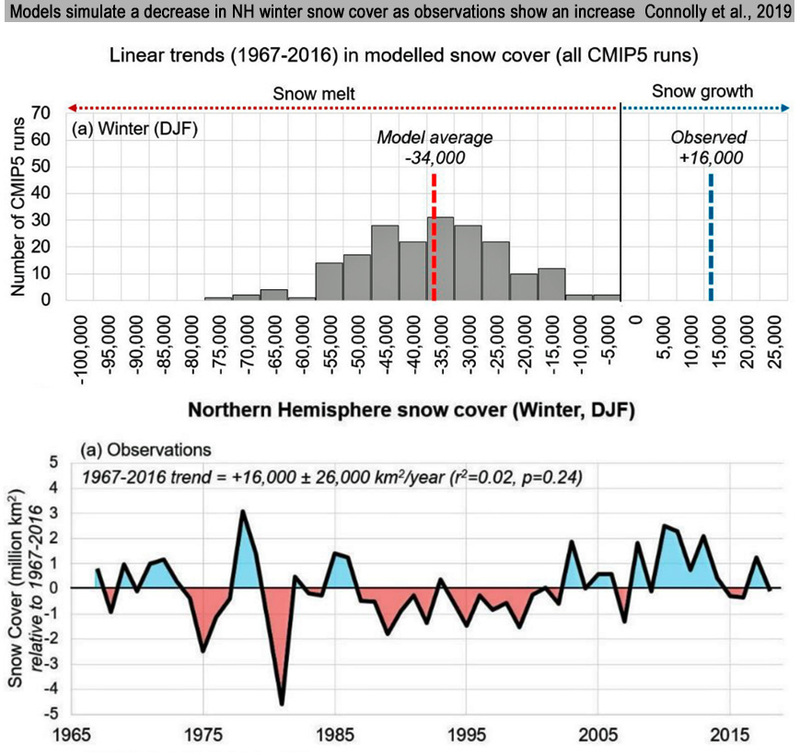 Updating trends in satellite-observed GPP enhancement, Winkler et al. 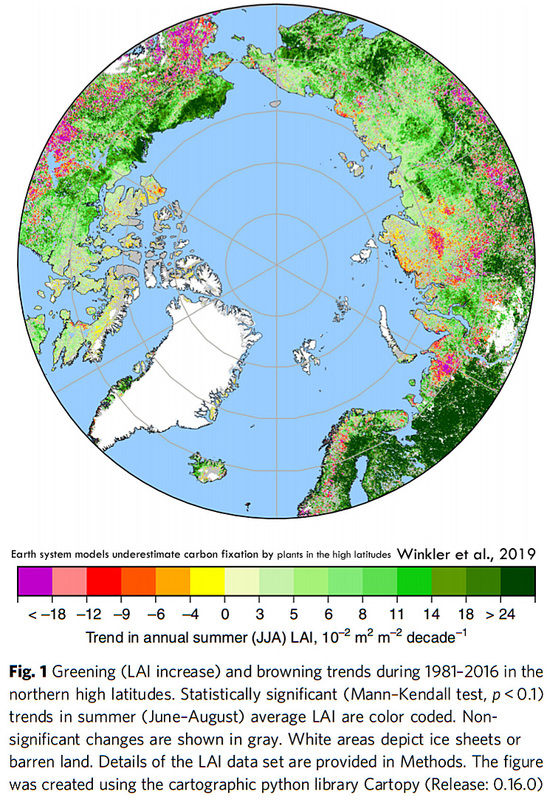 (2019) cite a statistically significant 52% greening trend during 1981-2016, outpacing the observed changes in browning (12%) by more than a factor of 4. 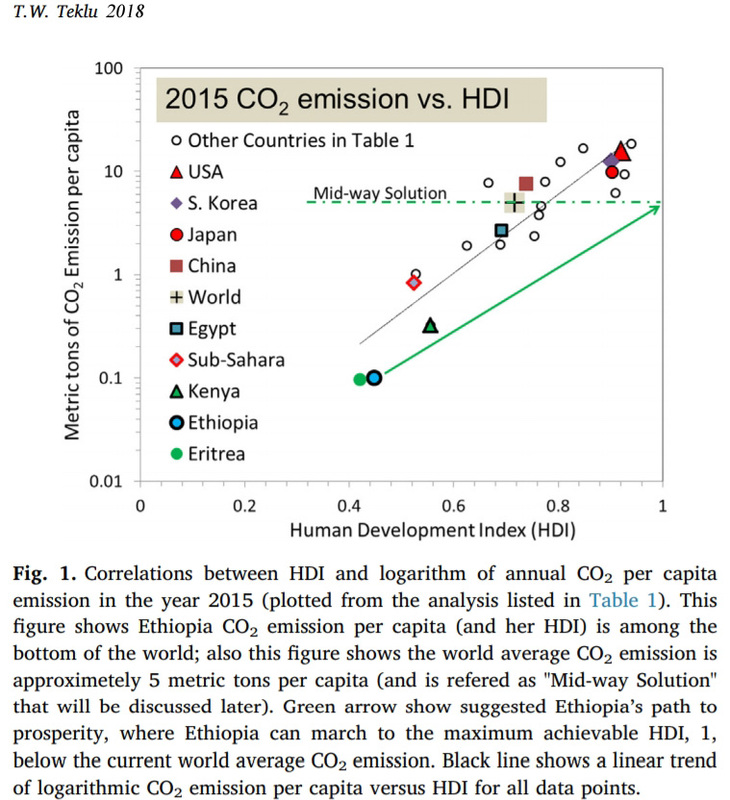 The key finding of their study, though, is that Earth system models have been categorically underestimating CO2’s critical role in enhancing GPP. Earth’s greening trends are expected to intensify as CO2 concentrations continue rising. Wenzel et al. (2016) project a ~35% increase in global GPP (greening) in the coming century, or as CO2 levels double (to 560 ppm). 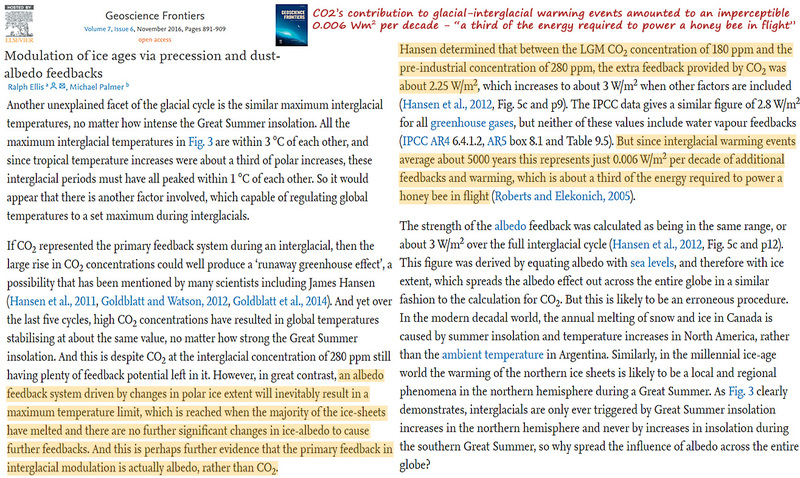 It would not appear that these scientists would agree with Dr. Michael Mann’s characterization of CO2 as “pollution”. 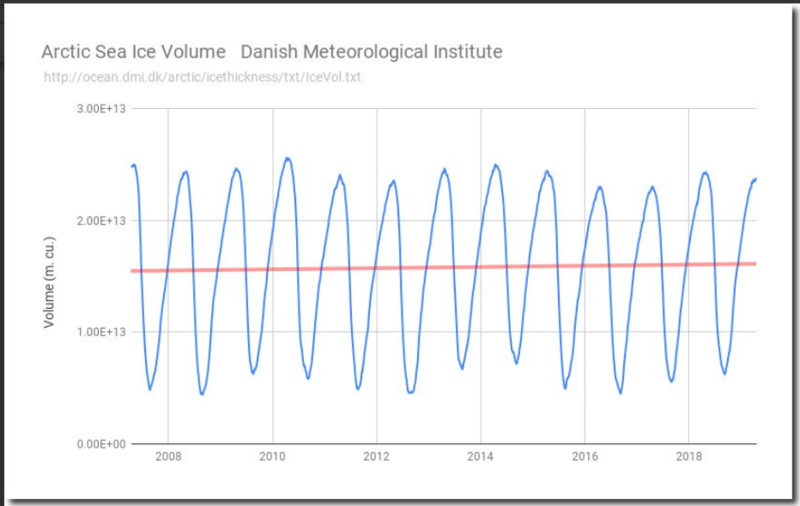 Yesterday I wrote here how some scientists misrepresent the observed data concerning Greenland ice melt in order to get the alarming results they want. There we see that Greenland has been melting, but recently much more slowly than what we are often led to believe. Data source: Danish Meteorological Institute. Chart by Kirye. Surprise! 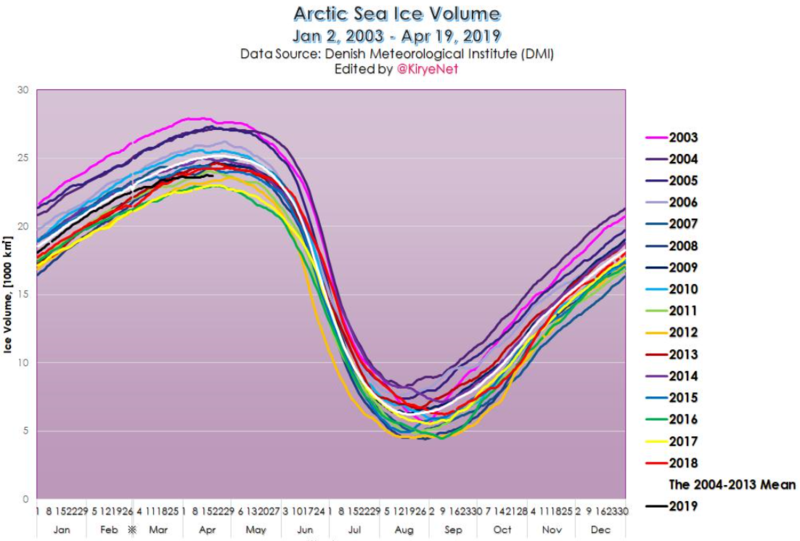 Arctic sea ice hasn’t been melting at all. Instead it has been gaining in mass 12 years now. This is quite embarrassing to the global warming alarmists. And, believe it or not, things might even get a whole lot more embarrassing when we look at natural cycles. Natural oceanic cycles behind the trend? Likely natural oceanic cycles, possibly with a link to solar activity, have inconveniently reversed the trend. 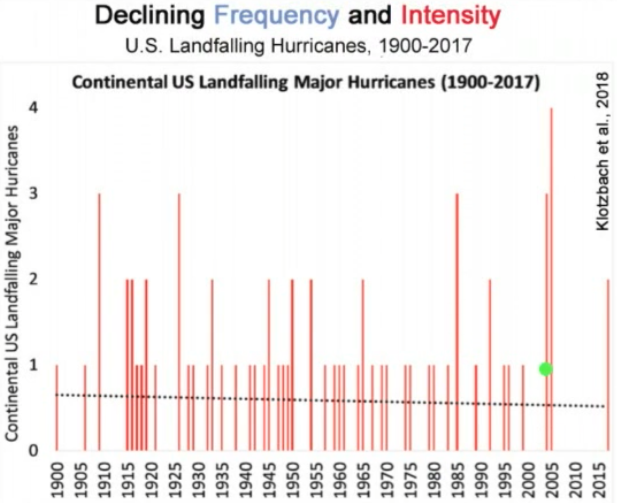 At a recent Weatherbell Saturday Summary, 40-year veteran meteorologist Joe Bastardi brought up the Atlantic Multidecadal Oscillation (AMO) factor. 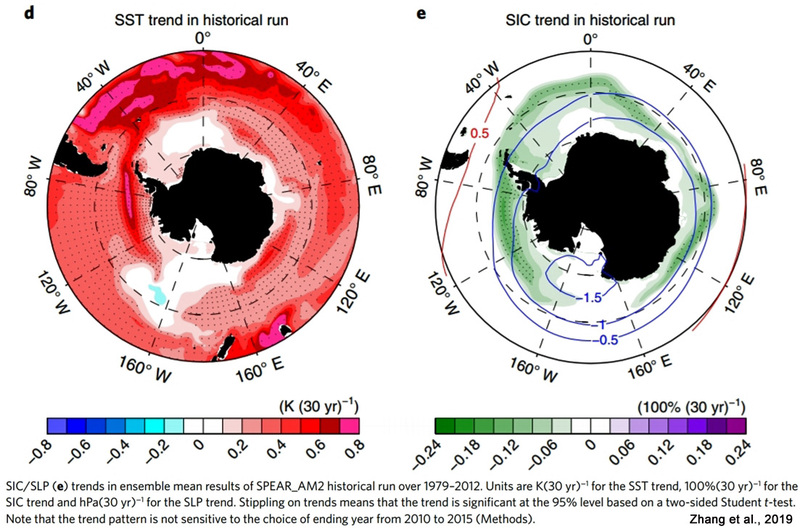 Bastardi shows how in 2005 the North Atlantic sea surface temperatures (SSTs) were above normal, and they led to melting ice. Image cropped from Weatherbell Saturday Summary, April 13, 2019. 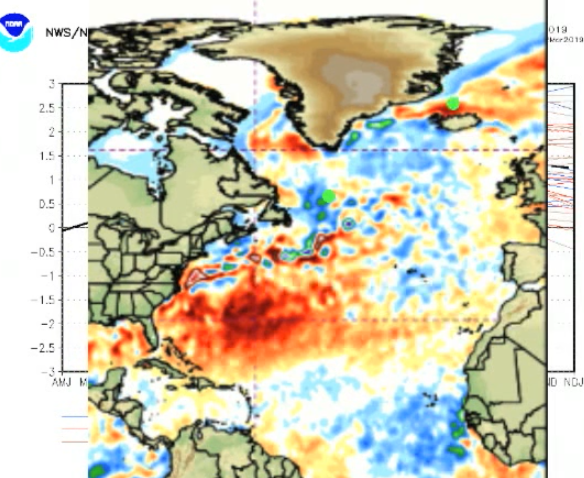 But today the picture has flipped to colder than normal North Atlantic SSTs, which naturally put the brakes on melting, or even reverse the trend and cause ice mass to increase just as it has done over the past 12 years. When Greenland ice melt data are correctly presented, Greenland it has in fact decelerated recently, thus contradicting alarmist claims by a new paper’s authors. 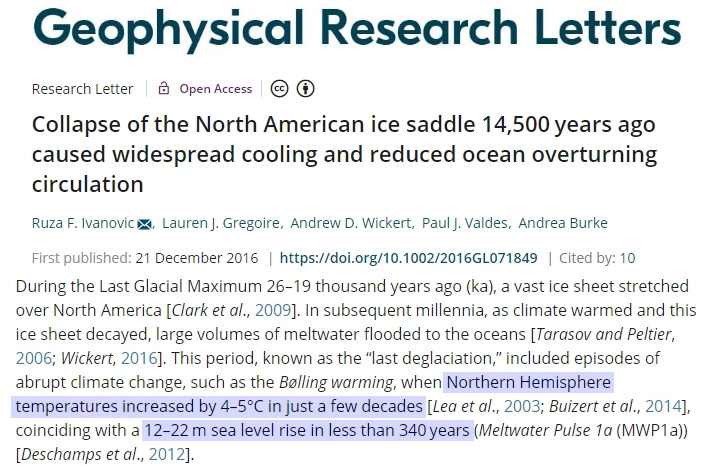 Already in January 2019 a very peculiar scientific publication on the allegedly increasing glacier melt had been a topic here on Die Kalte Sonne under the title ‘Faktenwäsche’? (fact laundering?,) which came to a very different result. It is a very peculiar situation when an erroneous and highly manipulative image is released for non-commercial reproduction, but no changes are allowed to display it correctly. Today, however, modern software offers functions with which such problems can be overcome, for example with an overlay over the unchanged original image. 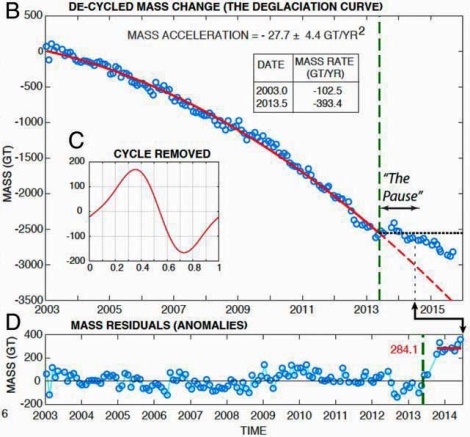 If one scales the time axis of the residuals (D) to that of the ice loss curve (B) and adds the missing data in a separate overlay, there is no “pause” for the period 2013/2014, but rather a clear mass increase since 2013 for the glacier ice, which is supposedly melting more and more. Figure: Overlay of the authors diagram plus original diagram (D) from Fig. 1 of Bevis et al. (2019) https://doi.org/10.1073/pnas.1806562116 (Merely changing the format never creates a derivative). Note: The red bordered overlay is an own work of the author, which shows the data missing from diagram (B) of Bevis et al. (2019) but only graphically. No more alarm: the ice melt on Greenland has slowed significantly since 2013. Conclusion: The well-known “illi omnia experti” from Caesar’s “De bello Gallico” does not mean that all the experts mentioned there were experts, but rather that they merely tried everything. And this is exactly the same with the climate policy “experts”, as they as well are doing everything they can to help a global climate religion achieve a breakthrough. So they are not climate scientists at all, but climate climate religious missionaries – and they are cleverly misusing the credibility of science as a vehicle for spreading their climate ideology. Modern natural sciences, of all things, were once an essential instrument of the Enlightenment, which finally freed us from a strictly religious absolutism. New German Study Shocks Electric Cars: “Considerably” Worse For Climate Than Diesel Cars, Up To 25% More CO2! 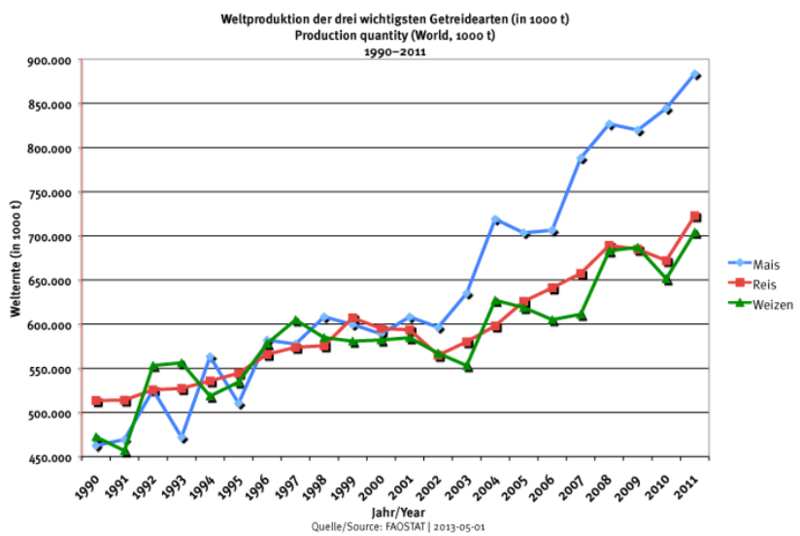 Germany’s Stuttgarter Zeitung here reports that electric cars are in fact pretty bad for the climate, it turns out. So, once activists are done banning fossil fuel powered vehicles, then electric ones will soon follow. According to a new German study, electric cars have “significantly higher CO2 emissions than diesel cars”, and especially the Tesla Model 3 “performs particularly poorly” as it emits over 150 grams of CO2 for each kilometer it travels! Up to 28% more CO2! According to a study led by Christoph Buchal of the University of Cologne released by the Ifo Institute in Munich, when one takes into account Germany’s current energy mix — where the share of coal and gas still remains considerable — and the amount of energy used for electric car battery production, CO2 emissions by electric cars are higher than comparable diesel powered cars. 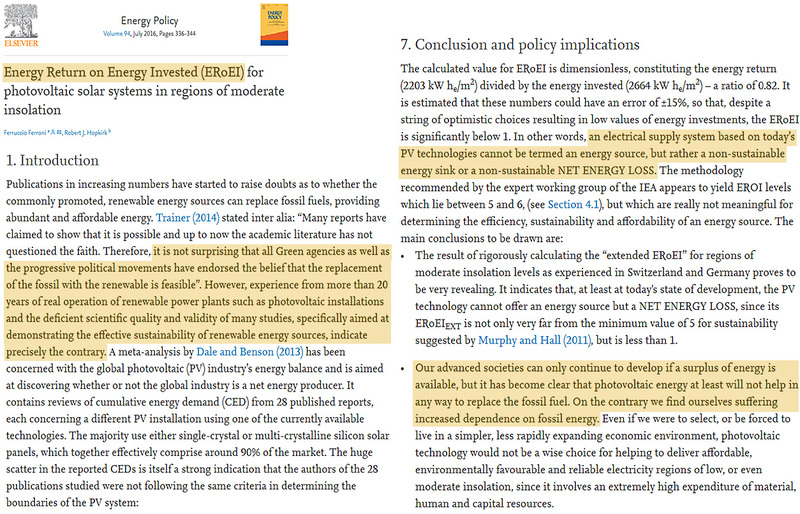 Co-authors of the study were energy expert Hans-Dieter Karl and renowned economist Professor Hans-Werner Sinn. Citing the results of the study, the Stuttgarter Zeitung writes that when the production of the batteries is accounted for, an e-car “burdens the climate 11 – 28% more than a diesel car”. Dirty e-cars: emit up to 180 grams of CO2 per kilometer! The Ifo Institute compared the Mercedes C 220 diesel cars and the new Tesla Model 3 in terms of diesel and electricity consumption and used the German electricity mix from 2018 as the basis for calculation. The study also criticizes how the EU legislator likes to consider electric cars as being “zero-emission” vehicles, thus giving the impression electric cars do not cause emissions and have little impact on the environment. The Ifo Institute researchers found that other technologies, however, offer great potential, for example hydrogen electric cars or combustion engines powered by “green” methane. According to the study, the methane-powered engine is the cheapest and is almost a-third lower in CO2 emissions than the diesel engine. According to the calculations of Dr. James Hansen, the radiative influence derived from the increase in CO2 during the last deglaciation was so negligible that it equated to “a third of energy required to power a honey bee in flight” (Ellis and Palmer, 2016). 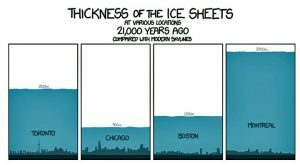 Between about 22,000 and 17,000 thousand years ago, Earth’s sea levels were about 120 meters lower than they are now because much of the Earth’s seawater was locked up in kilometers-thick continental ice sheets. 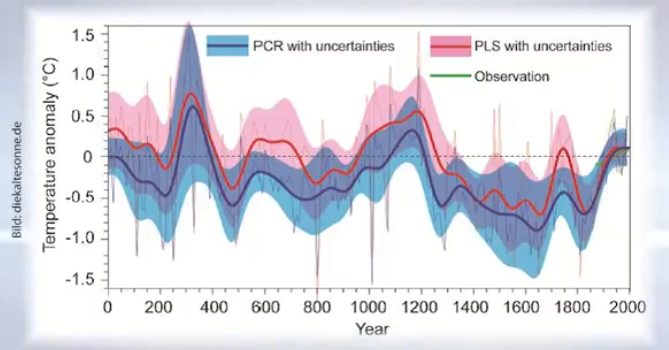 Then, about 14,500 years ago, nearly the entire Northern Hemisphere abruptly warmed up by about 4-5°C within a span of about 20-30 years as sea levels rose at rates between 3 and 6 meters per century (Ivanovic et al., 2017). 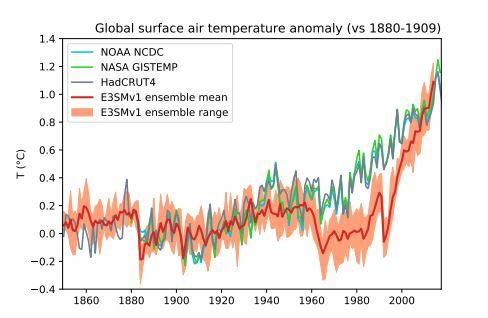 Northern Hemisphere sea surface temperatures warmed by 3°C in less than 90 years during this time. 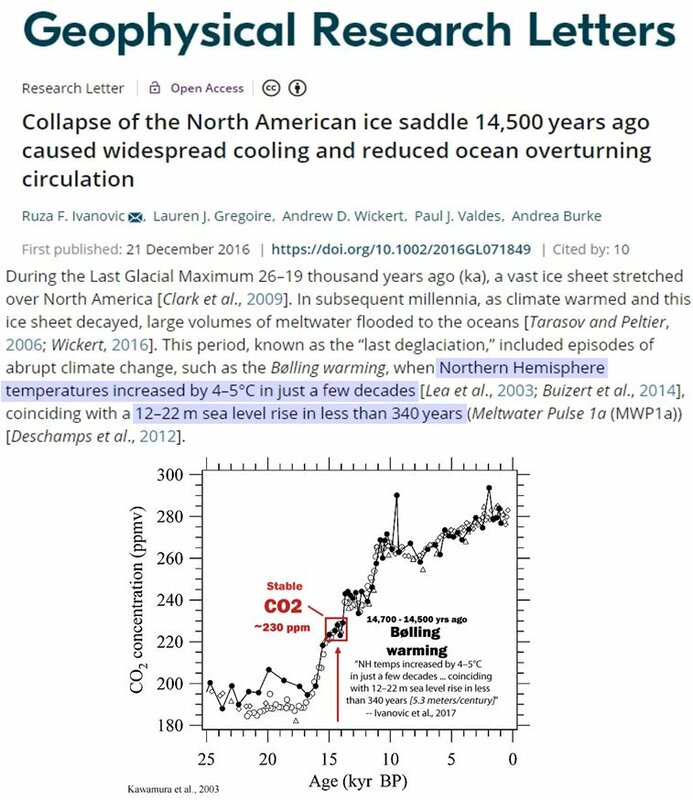 The Earth cooled and warmed and cooled and warmed for the next 3,000 years, during which time there was a gradual overall increase in global temperature of about 5-6°C superimposed on the abrupt decadal- and centennial-scale climate undulations. 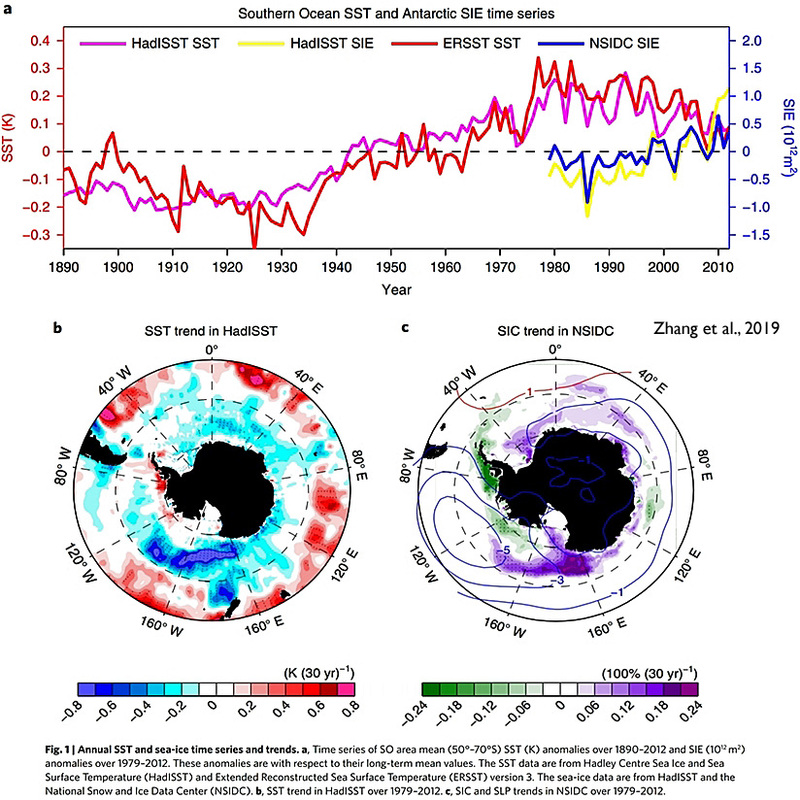 By 11,700 years ago, when Greenland warmed up by 10°C within about 50 years (Steffensen et al., 2008), the last ice age glacial period ended and the Holocene interglacial warmth we now enjoy officially commenced. 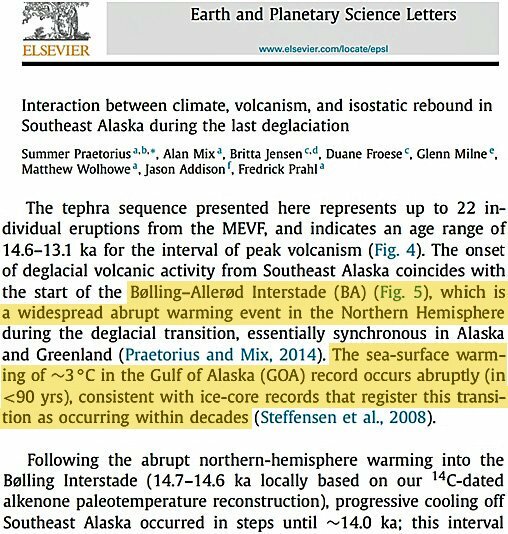 And yet one has to wonder how this conclusion could have been reached when the explosive warmings of degrees-per-decade occurred without any clearly detectable changes in CO2. 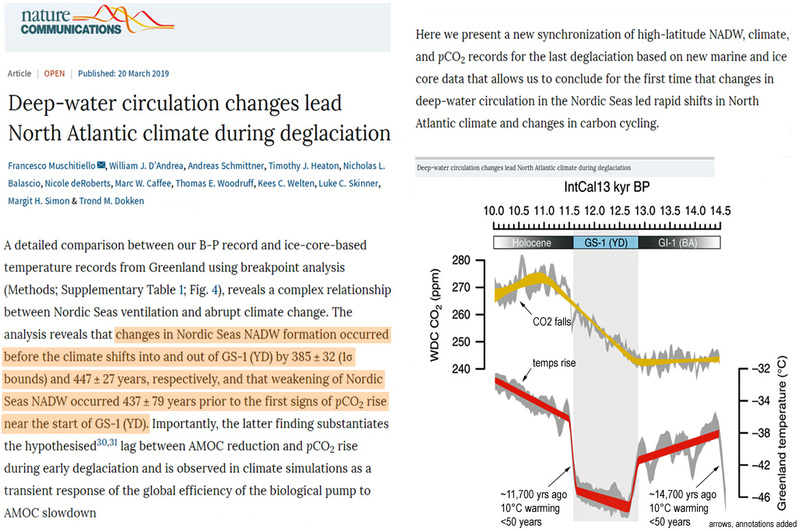 With this vanishingly small forcing magnitude, why is it nonetheless thought that CO2 is a macro-level driver of Earth’s temperatures and a determinant of deglaciation transitions? NDR north German television recently broadcast a report about the protests against a planned windpark near the German village of Kreien, some 200 km east of Hamburg. One local resident told NDR television the area is already packed with 178 turbines, and that the plans to build 14 new over 200-meter tall behemoths are no longer welcome. 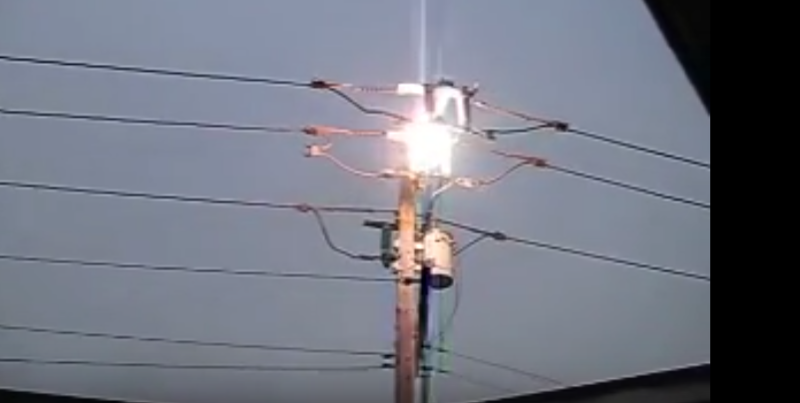 The resident had noticed something very peculiar: a loudspeaker system that had been installed in the area of the planned project (see video, 0:20 mark). Apparently the speaker system had been put in place to scare away white tail eagles that might get the idea to nest atop an adjacent nesting mast just meters away. The mast had been provided earlier for the purpose of providing a nesting place for the endangered bird species. 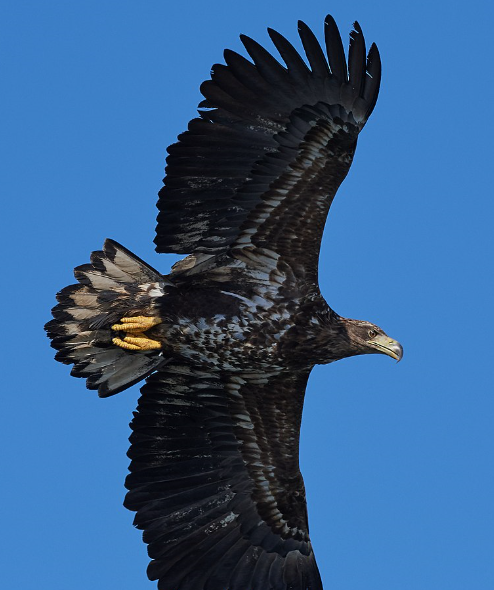 White tail eagles nesting there would mean a sure stop of the project, and shooing them away would ensure the go-ahead for the wind project. Eagles entering the area and looking to establish a nest there would be scared away by the sound of barking dogs blaring from the speaker (2:40). The result: keeping the nest empty and thus a free path for the construction of the wind park by wind project company UKA Nord. Residents in the area have reacted angrily at the prospect of yet even more giant wind turbines getting erected in their area, and especially at the tactics used by UKA Nord to ward off potential nesting birds. One local mayor described the loudspeaker measure as “unbelievable”. Climate protection before habitat protection? At the 3:30 mark of the report, citizens are shown banding together to organize a citizen’s group against the project. So far they have seen some success. The UKA Nord has since turned off the speaker system and it’s been decided to dismantle it. Yet, plans for the construction of the park still have not been halted. A potential wind turbine installation on the island of Crete may be poised to drive an endangered raptor population to extinction. Recent studies have found the favored “renewable” energies – wind and solar – are not effective, even counteractive, when it comes to reducing emissions from fossil fuels. Solar PV installation, for example, results in a net loss of energy, meaning that the net effect of solar energy use is ultimately more dependence on fossil fuels. 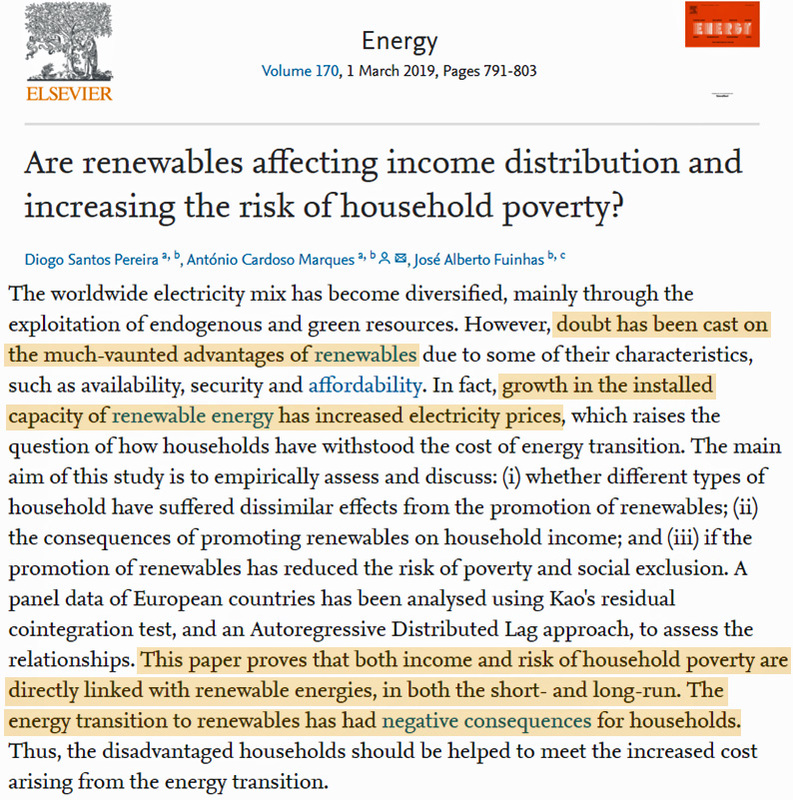 Due especially to its intermittent energy generation, the installation of wind turbines also necessitates eventual growth in fossil fuel energies to back them up (due especially to the frequent occasions when the wind is not blowing). Even worse, the installation of wind turbines have been well documented to destroy wildlife habitats (Marques et al., 2019, Millon et al., 2018, Lange et al., 2018, Barré et al., 2018). Frequent soaring species collisions may ultimately lead to widespread extinctions (Naylor, 2018 , Watson et al., 2018, Vasilakis et al., 2017 ) in the coming decades. 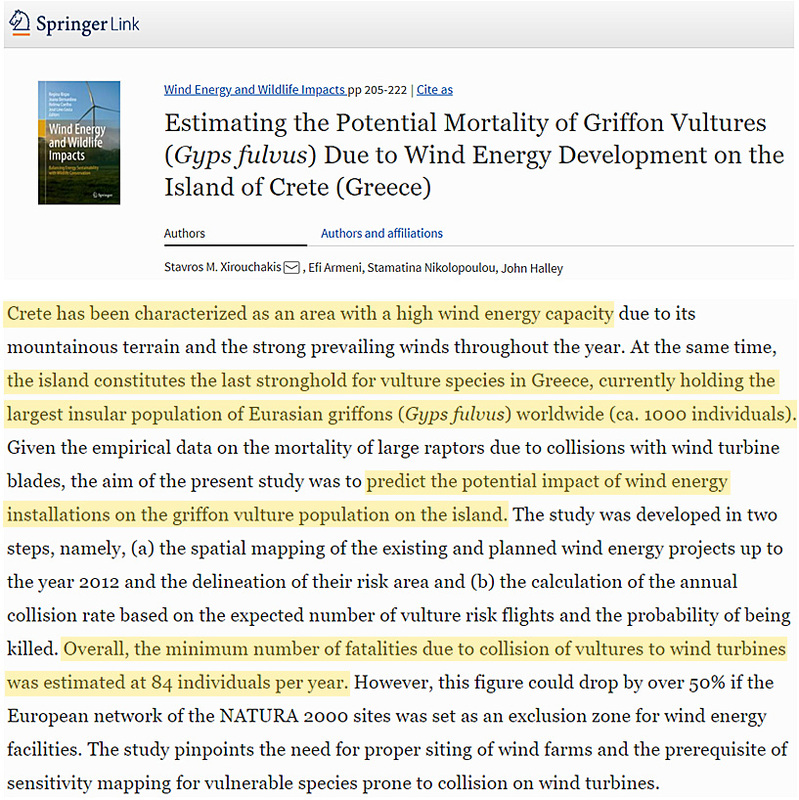 In a new paper (Xirouchakis et al., 2019), scientists detail the austere short-term mortality risks wind turbines pose upon an endangered griffon vulture on the island of Crete. Considering the unreliability and counteractive effectiveness of wind turbine use in mitigating fossil fuel dependency, one needs to ask why we are willing to risk the extirpation of rare raptor species for the purpose of expanding “renewable” energies that increasingly seem to do more harm than good. In most scientific fields, hypotheses that fail to be verified by real-world observations 85% to 100% of the time are rejected immediately. 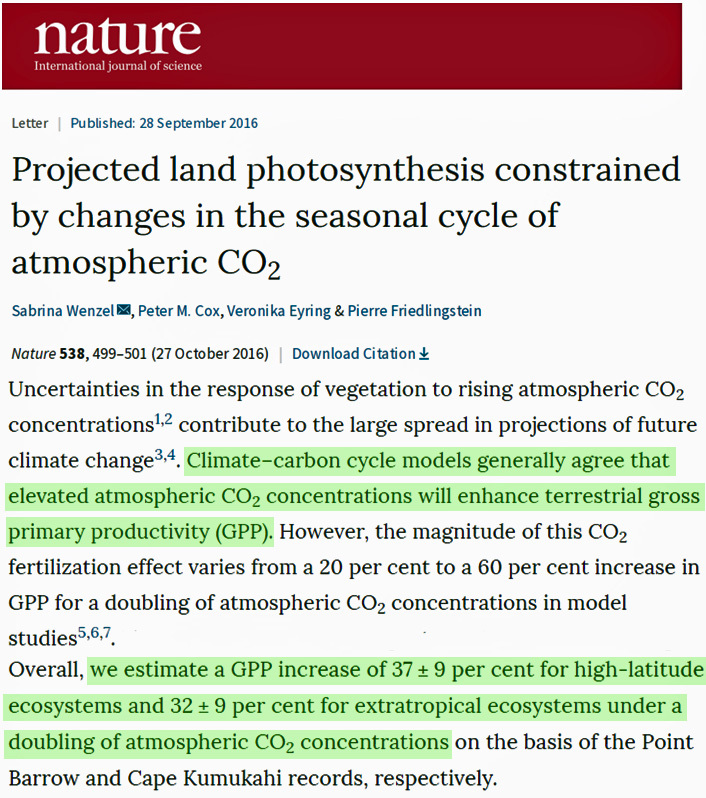 In Consensus Climate Science, when 126 of 126, 111 of 114, 42 of 49… modeled projections are wrong, or when the opposite sign of the modeled trend is observed, the climate models are still regarded as mechanistically correct, especially with regard to the CO2 climate influence. Those who disagree are dismissed as “denialists”. 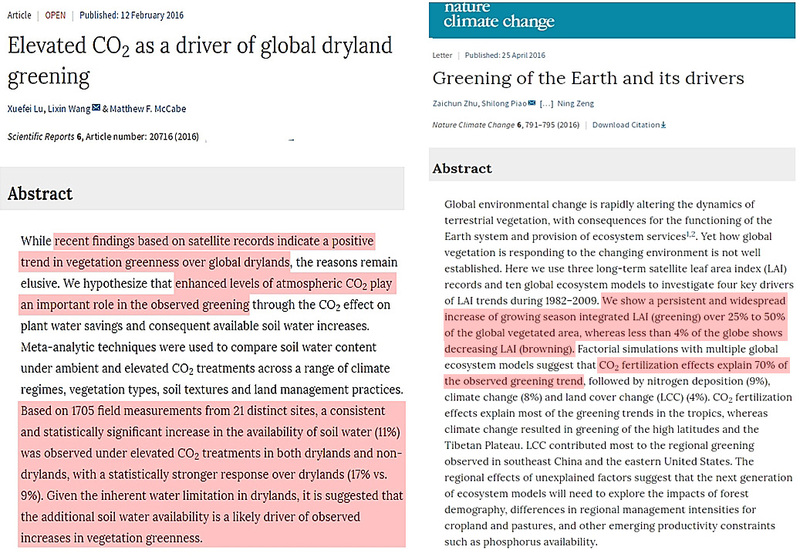 For 2019, the opposite-sign, contradicted-by-observations models continue to be highlighted in the scientific literature. 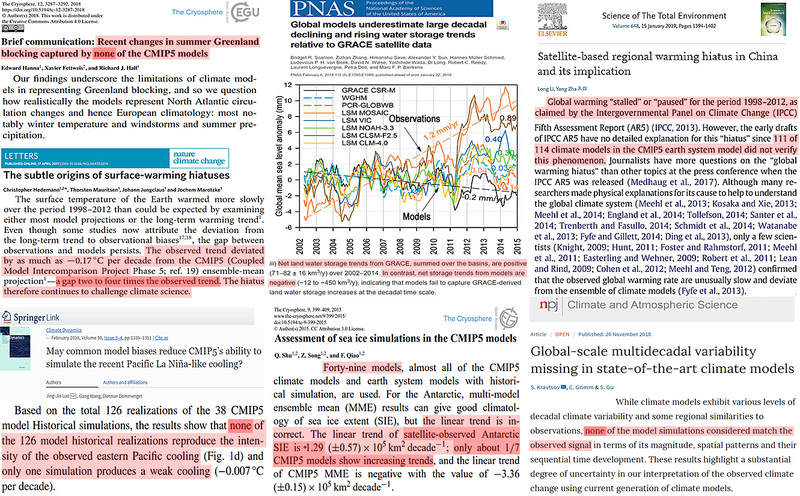 At what point will Consensus Climate Science actually question if the greenhouse gas forcings the models are predicated on need reconsideration? Climate disaster? 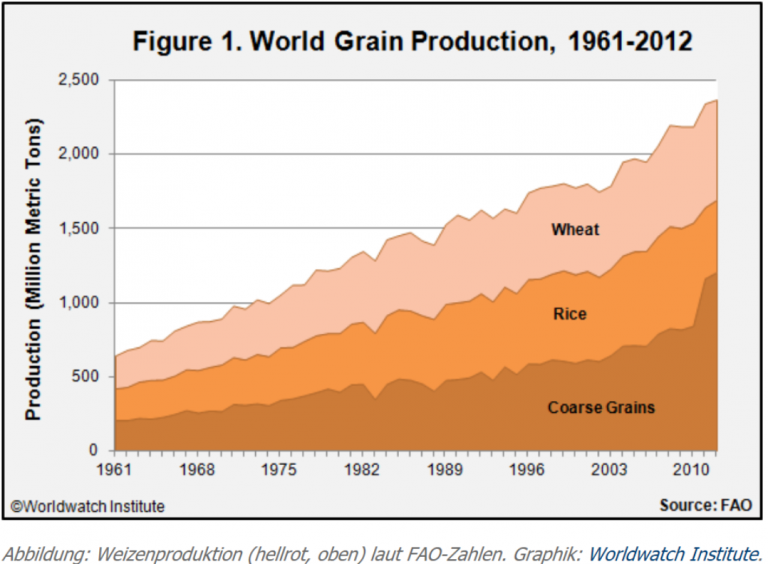 Grain production almost quadrupled worldwide while the population doubled over past 60 years! In these times of Fridays for Future led by Greta Thunberg, all experts and self-proclaimed experts are talking about how badly the earth is doing and warning that planet earth is about to collapse unless action is taken immediately. It’s claimed that all experts agree on their vision of the future! Droughts, floods, crop failures and famines threaten – and millions of climate refugees will make their way from south to north. 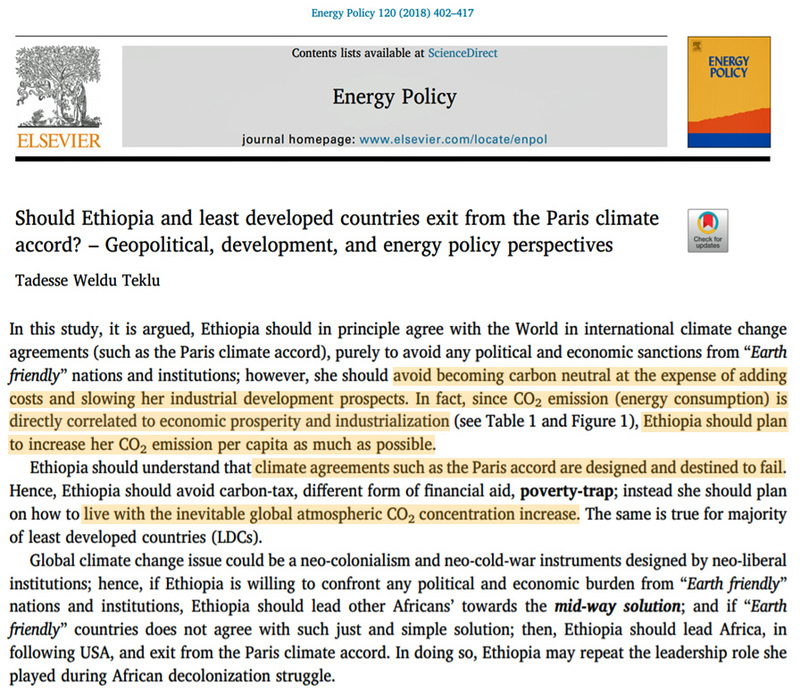 These are the visions of the “climate impact researchers”. But is that really the case? The opposite is the reality. Let us first take a look at the grain yield of the most important cereals grown in the world. Miracle upon miracle. The grain yields per hectare of corn, rice, wheat and barley have increased strongly over the last 25 years and have not decreased at all, despite all the climate horror claims. In the case of maize, the yields per hectare have almost doubled. Maize yields have increased by around 80%, rice by around 65%, wheat by around 70% and barley by around 65%. And this in times when droughts and torrential rains are supposedly reducing the harvest yields? 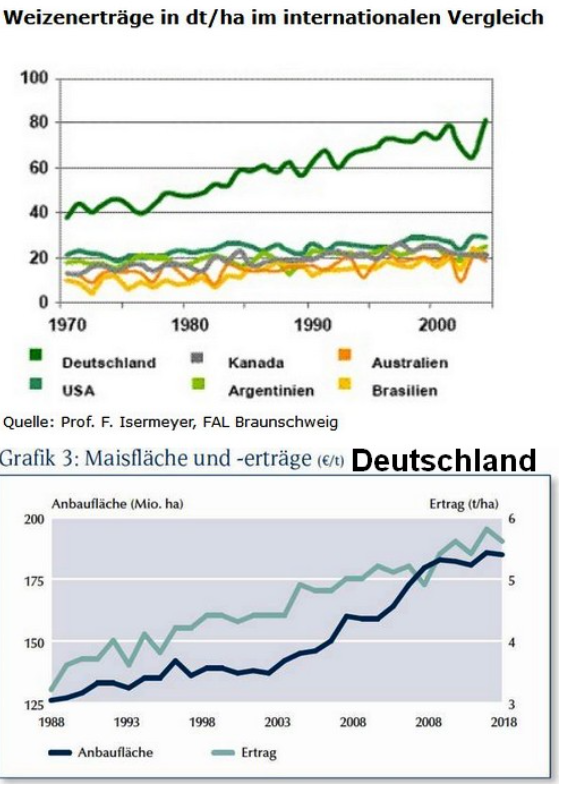 If you look at the world harvests of the most important grains, they have also risen sharply over the last 25 years. The amount of maize harvested has roughly doubled, i.e. increased by 100%, the amount of rice harvested by about 75% and the amount of wheat harvested by about 80%. 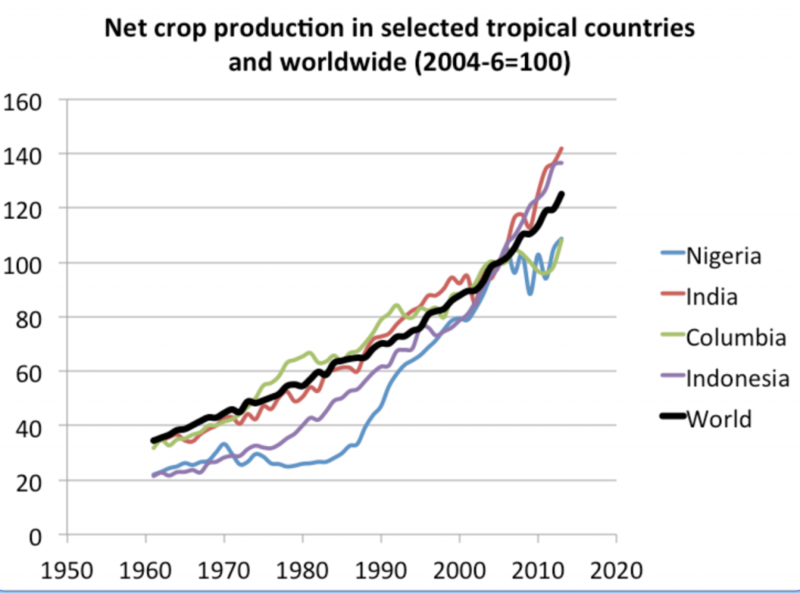 If we look at global grain production and grain production in selected tropical countries, this has increased sharply since 1960. On average, production has quadrupled! And when we look at the world grain production as a whole (wheat, rice and coarse grains), production has quadrupled since 1961! 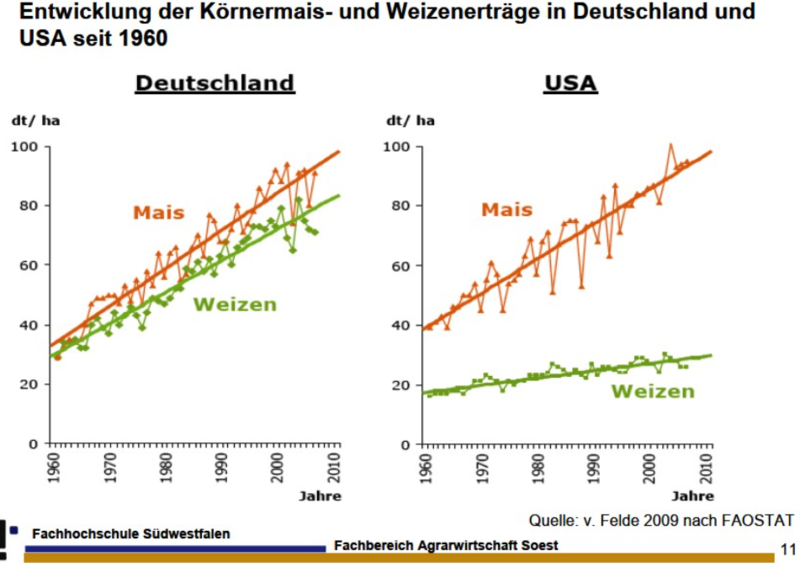 The above figure shows how in Germany and the USA yields per hectare of cultivated land have risen sharply since 1960. Maize in Germany by approx. 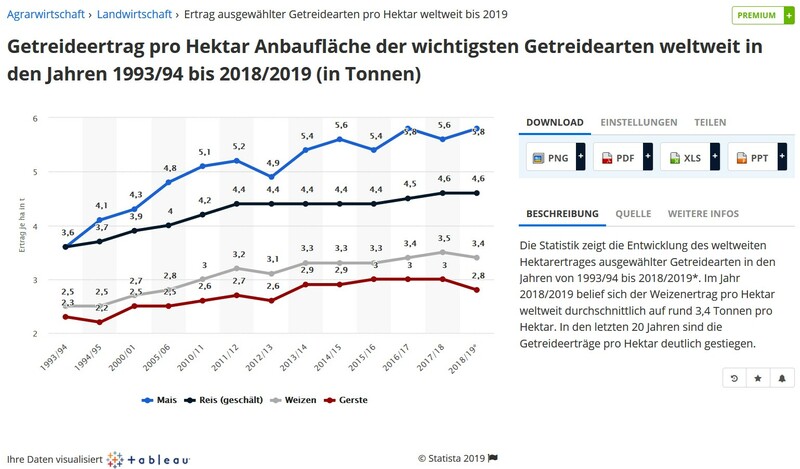 130% and for wheat in Germany by approx. 120%. This is more than doubling. Maize in the USA has jumped by approx. 110%, for wheat in the USA approx. 75%. So almost doubling. 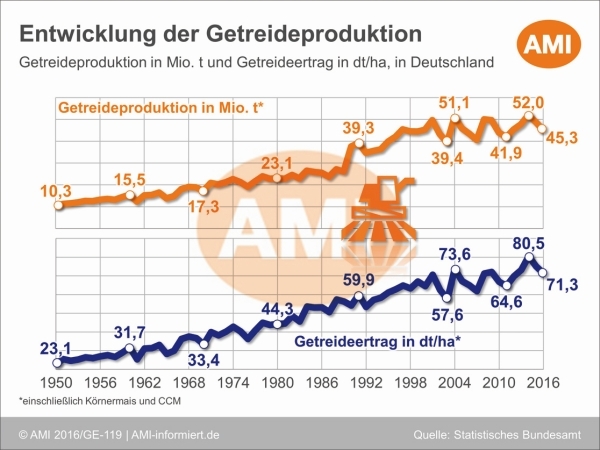 If we look at the development of grain production in Germany since 1950, we can see a significant increase both in the total harvest quantity and in the yields per hectare. The total grain production has increased by about 450%, the grain yield by about 350%. By international standards, wheat yields per hectare of cultivated land have risen worldwide. 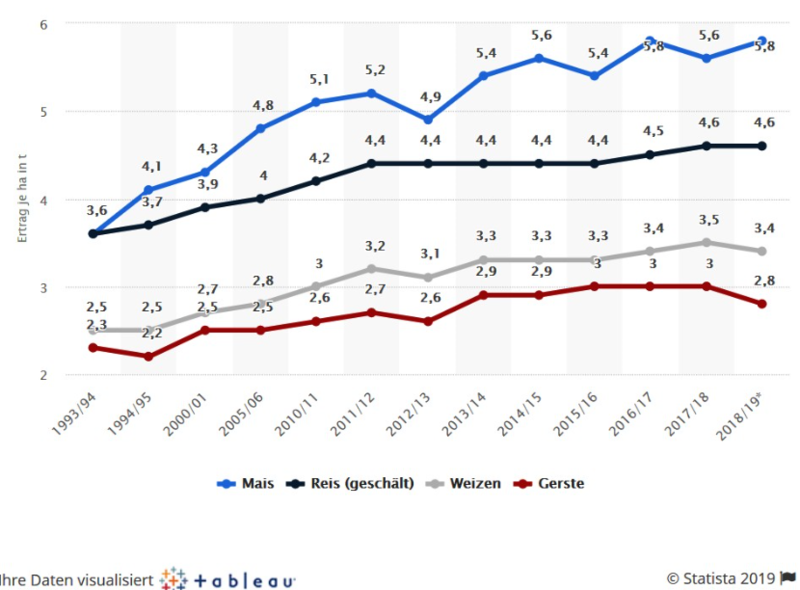 Germany, in particular, is distinguished in wheat cultivation by high yields per hectare and a strong increase in yields per hectare. The yield per hectare of wheat has more than doubled since 1970 and is four times higher than in other countries. And maize acreage and maize yields have also grown strongly in Germany. In the last 30 years, the yields per hectare of maize have almost doubled and the area under maize has increased by about 75%. The question is: Why don’t you hear about it in the media and news? As a rule, there are only reports of failed harvests and famines, but no new record harvests. 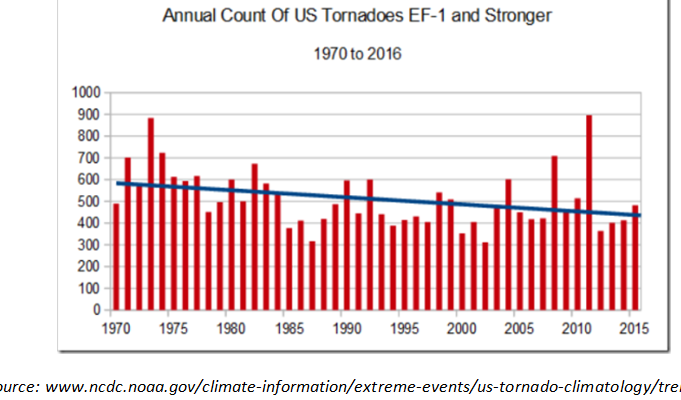 Perhaps simply because this does not fit into the picture of a climate catastrophe? Now imagine that the Arctic and Siberia would also become fertile arable land as a result of global warming and that crop yields increased even further as a result. Would that be bad or good? We often hear how the climate is changing everywhere, like in California. Listening to the media we get the impression that the Golden State is drying out and risks burning up, before heavy rains hit. Others claim the state is facing “weather whiplash” because climate change will make the weather more extreme and volatile. Today we take a look at the precipitation data of 7 stations spread across the state to see what changes have been happening. Used here are the data from the Japan Meteorology Agency (JMA) that cover the last 33 years. As we can see, there has been no trend over the past 30 years. Variability also appears unchanged. 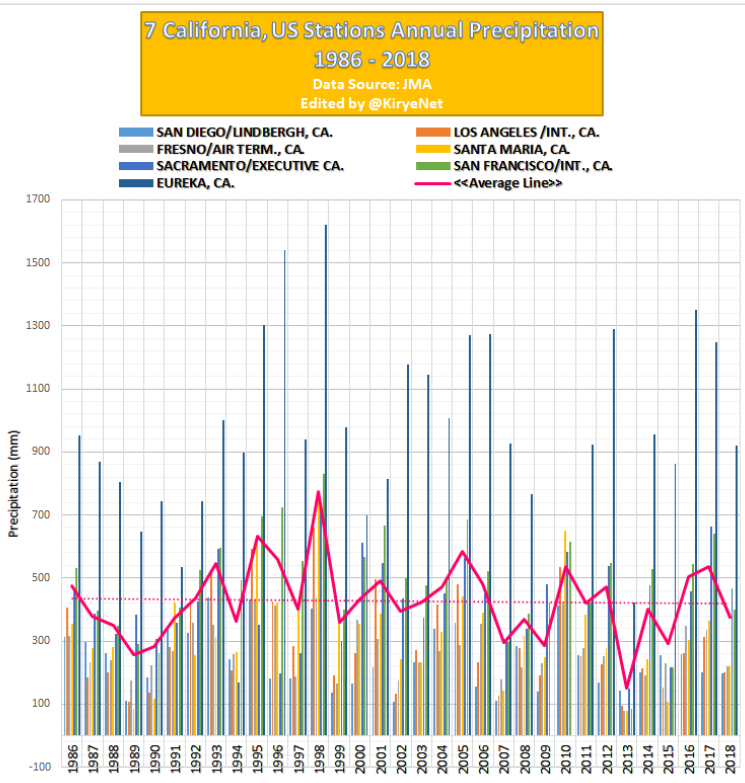 California has always been a state characterized by alternating periods of drought and rainfall influenced by oceanic cycles like ENSO. The data show everything is within the normal range. The real trend is the massive increase in media climate ambulance chasing where every anomaly gets hyped into something much more than it really is. 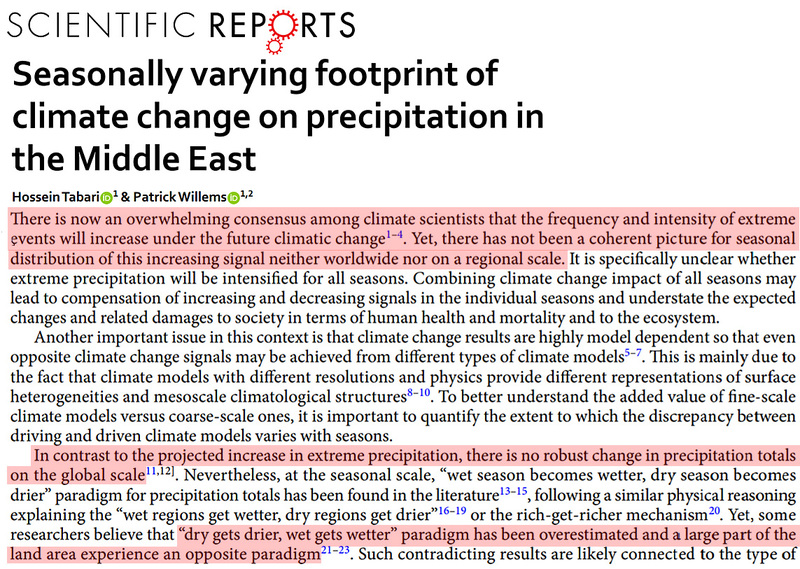 A new paper published in the Journal of Weather and Climate Extremes by Dittus et al confirms what many skeptics has strongly suspected all along: There’s no trend in precipitation extremes and there isn’t much predictability either.